Why Our Parents and Grandparents are Coming Down with Alzheimer’s (and other dementias too) Will We Be NEXT? (8 minute read) At social events, from church to ballgames to cocktail time, stories of our children and parents seem to bubble up in every conversation. Oftentimes, the brain condition of our parents weasels its way into those discusses. And understandably so, since 1 in 10 human beings age 65 and older suffers from some form of dementia. The statistics are even grimmer for those 85 and older, a whopping 1 in 2.5 are drowning in it! As a society, we are now facing our third generation of Alzheimer’s and other dementia with no cure. We are seemingly helplessly watching it vacuum away the minds and lives of our loved ones. Many of us have buried grandparents who were scourged by the disease, and several see our parents slipping away. When we experience the brain fog, poor balance, and exhaustion of those senior moments, we worry that we might succumb to it too. By studying global populations for an answer, we encounter the healthy Blue Zones around the world. They eat no processed, packaged foods. Sitting still is not part of their daily routine; they are constantly active, exercising their bodies and minds. Along with getting plenty of sleep, stress is not in their lives. They enjoy a sense of community and are committed to their families, friends, and a life purpose. This, in turn, helps them remain active and play a vital role. Closer to home, some folks exhibit these same characteristics, albeit not the nutrition aspect, yet they slowly sink into the abyss of Alzheimer’s or other types of dementia. What, then, is the problem? In search of the root cause of why some succumb while others do not, nearly 200,000 published studies, representing years and years of scientific research, have been conducted on Alzheimer’s. These studies indicate that dementia is not a normal part of aging. On the contrary, it is an actual disease, and it can be stopped and even reversed in most cases. The only way to stop disease is to discover and halt the root cause, so we must begin with a basic understanding. Simply put, dementia is the death of a significant number of brain cells, specifically neurons and their connecting cells, the synapse, which leads to cognitive impairment. Other supporting cells, the glia, die as well. The fatality of these cells causes the brain to malfunction, and we experience cognitive impairment. Ultimately, because the brain cannot function as intended, it cannot communicate properly with the organs, and we face total body death. Cognition is defined as our ability to think, feel, and act upon new information, to process thoughts and take or make physical actions based upon those thoughts. a combination of both of the above. There are several triggers to this starvation and super-hyper inflammation, I’ve grouped them into seven based on the findings of Drs. Blaylock and Dale Bredesen. Dr. Bredesen was the first physician to publish a solution for the reversal of cognitive impairment. This knowledge, combined with studies and theories of other doctors (Drs. 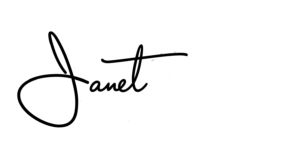 Edward Group, Datis Kharrazian, Thomas Lewis, Charles Gant, Alessio Fasano, Sidney MacDonald, Tom O’Bryan, Tom Suit, Raphael Kellman, David Perlmutter, Mark Hyman, Elizabeth Boham, Frank Lipman, Drew Ramsey, Ann Hathaway, and many others) can lead us to some long-sought answers about dementia. Considering the wide array of causes, it is no wonder that there is not one magic pill or miracle cure to rid the world of dementia. That said, just as there are multiple causes, there are multiple, and combined, methods to reverse Alzheimer’s and other forms of dementia. 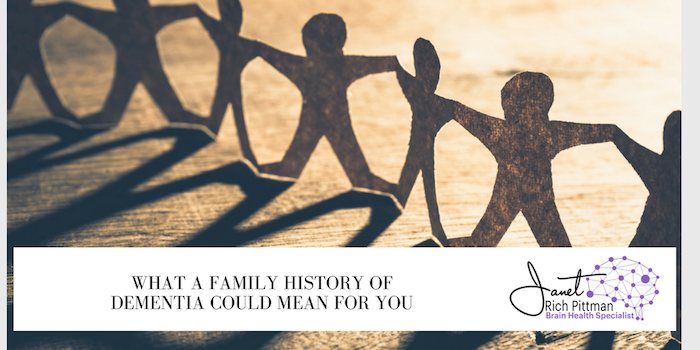 Cross-referencing these triggers with key lifestyle factors in the Blue Zones, where dementia does not seem to be a problem, we begin to understand why our parents and grandparents are afflicted with the disease. Not only that, but we can also determine where we are in terms of probability. For ways to discover your susceptibility to these triggers and advice on fighting them, even reversing their effects, which are the early symptoms of dementia, let’s talk. You can enjoy, long-term, good brain health as you age and NOT fall into dementia, Alzheimer’s. On my basis of years of neurodegeneration research coupled with training from doctors who have reversed cognitive impairment, reversed Alzheimer’s, I can provide individualized, personal plans of action so you or a loved one can restore precious memories, regain brain energy and have good brain health. Actually, it is not just a plan but an individualized, detailed protocol system. Click here to schedule a FREE 15-minute telephone appointment. There is no cost to you. We’ll talk for 15 or so minutes, you give me your story, or the situation of your loved one, along with the symptoms, and together we can see how to get the brain in gear and make sure NOT to fall into dementia/Alzheimer’s. Right now? It may not be the right time. But let’s stay in touch; know I am available if you ever need me. To help you though, take advantage of free membership to my Brain Health Revolution. 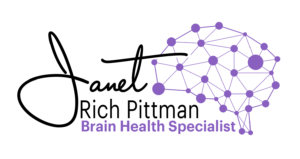 As a member, you will receive a few times each month some quick facts, tidbits, checklists and notes of interest on how to enjoy a healthy, strong brain and how to prevent dementia. 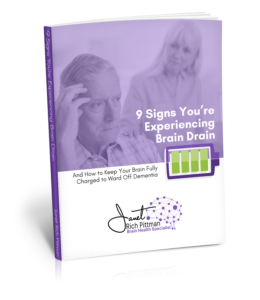 You can also receive more detailed information on the triggers listed above, including my ebooklet 9 Signs You Are Experiencing Brain Drain and How to Keep Your Brain Fully Charged to Ward Off Dementia. Get the booklet and join The Brain Health Revolution here. Helping you keep your memory, enjoy good brain health, and age successfully, I look forward to communicating with you again! https://janetrichpittman.com/wp-content/uploads/2018/05/3-e1526673266967.png 512 1024 Janet Rich Pittman, SCALA, CDP https://janetrichpittman.com/wp-content/uploads/2018/02/JanetRichPittman-300x159.png Janet Rich Pittman, SCALA, CDP2018-05-15 17:02:262019-03-18 14:40:38Why Our Parents and Grandparents are Coming Down with Alzheimer's (and other dementias too) Will We Be NEXT?